These words have both a deep and practical meaning to me. 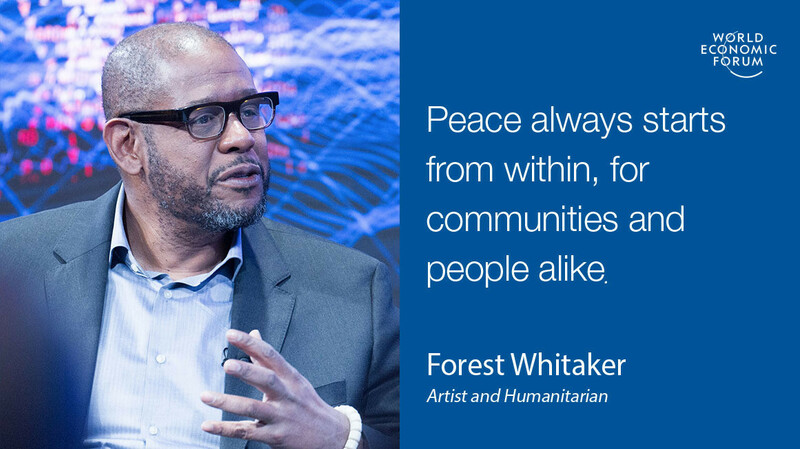 Facing the challenge of change is central to the humanitarian work I conduct through my foundation, the Whitaker Peace & Development Initiative (WPDI). My main objective is to build networks of young women and men from places that suffer from chronic forms of conflict and to support these young leaders as they engage in peace-building activities and develop educational and economic projects to the benefit of their communities. We work in such places as South Sudan, a country that is currently at war with itself after decades of a protracted liberation war. We also work in northern Uganda, a region where memories of the civil war of the past decade are still vivid. We work in Mexico with young women and men who have grown up in neighborhoods battered by drug wars. I also work in my own country, the United States, where we reach out to children and young people from vulnerable areas. At first, these countries may seem to be very different, but, in the places where we develop programmes, they share deeper similarities. These are communities stuck in cycles of violence. They know no real peace, only fragile truces, which will be broken at some point, because the silence of arms does not mean that any form of reconciliation has happened. When easily broken truces regularly alternate with episodes of violence from armed conflicts, we can speak neither of true peace or of real change, transformative change that makes a tangible difference in the lives of communities. This is the approach I follow with WDPI through its flagship programme, the Youth Peacemaker Network (YPN): to empower young women and men who can engineer change from within their communities. We want the young women and men with whom we work to become peacemakers and change-makers in their communities. Many of them have seen conflict with their own eyes; some have suffered violence in their bodies. Our first work with them is often to heal or soothe trauma, notably for those who happen to be former child soldiers. Their personal rehabilitation is a condition for collective reconciliation to happen in their countries. Some of the young people we support live in refugee camps and face one of the most pressing challenges of our times. Indeed, the UN estimates that today more than 65 million people are displaced by armed conflict or persecution. They need assistance from all the nations. There are urgent needs in terms of food and shelter, but there are other needs too. These are needs that may seem less vital at face value, but are in fact no less vital to address. It is very difficult to picture the helplessness of these people who have lost everything – their homes, their jobs, family members and friends – or to imagine the despair of parents whose children are left all day to idle on dirt. We have to think, for example, that 75% of secondary school aged refugees are out of school. When children and youth are deprived of their right to education, their community is deprived of a sustainable future. It is all the more true with refugees. It is imperative to take care of these youths and help heal their wounds. If no one cares for the physical and psychological well-being of these young refugees, then we allow the seeds of resentment and violence to be sown in them and we will only reap more conflict and war in the next generation. We must help them wherever they are. It could be Syria, where some 11 million people have fled their homes since the outbreak of civil war in March 2011. It could be Colombia, where decades of civil war have internally displaced nearly 7 million people. It could be South Sudan, where nearly 3 million people have been forced out of their homes since 2013 by civil war, including more than 1.8 million internally displaced and 1.1 million seeking refuge in neighbouring countries. It is in Uganda that I was first confronted directly with the situation of people displaced by conflict and violence. I was shooting the Last King of Scotland. I had the opportunity to speak directly with many of them, learning about their past and how they envisioned life in the present and the future. Then I started working with my foundation WPDI in South Sudan and, in 2014, I visited the UN camps for the Protection of Civilians in Bentiu and Juba. They had been established in response to the massive displacements of populations caused by civil conflict. It was a moving and humbling experience. I had other exchanges with young women and men: they felt abandoned; they were idle. This was all the more worrisome, because the traumas caused by the conflict and the forced displacement obviously had a strong grip on their minds and hearts. They suffered. They were exhausted, physically and mentally. They resented it. My fear was that they would grow up nurturing thoughts of vengeance that would in turn nurture cycles of conflict. Simply preaching the values of peace and dialogue would not work on such hardened lives: they needed to be actively engaged. I started two programmes in the Juba camp: Peace Through Sports and Cinema for Peace. In each case, we create a setting where fun and entertaining activities, which contribute to trauma healing, are combined with training and group discussions to help participants reflect on peace, tolerance and dialogue. Thousands of young people now participate in these activities. The Peace Through Sports programme has a wide appeal and its tournaments have become quite an event in the life of the camp. We have even managed to get the South Sudan Football Association to train and certify our referees and four of them have been enrolled in FIFA trainings. To me, a key success of these programmes is the change I’ve noticed in so many of the young people who live in the camp of Juba. They have changed inside; their outlook on life and life after the camp is less bleak. This gives me hope that, when they eventually find their way back home, their life will be different, more peaceful. Based on this, we have decided to launch, a new programme in the Kiryandongo Settlement, located in the north of Uganda. 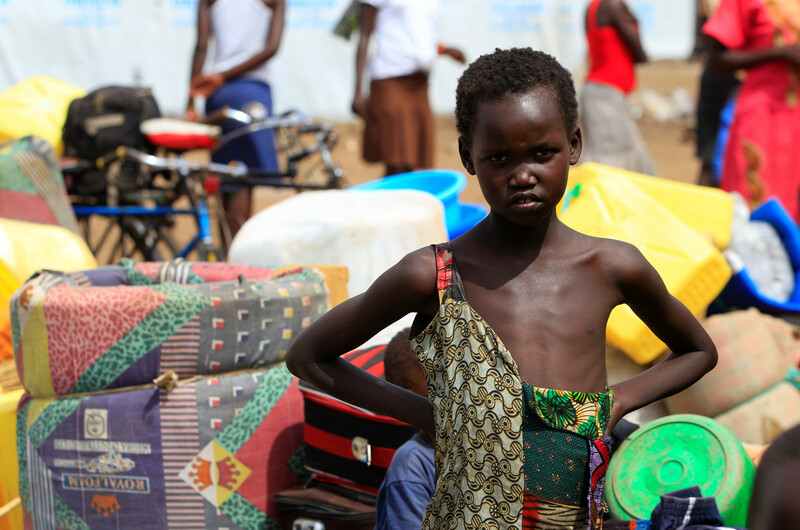 Uganda is currently host to 800,000 South Sudanese who have fled their country since 2013, and 400,000 since July 2016, when the civil war was taken to new levels of violence. One reason why we chose Uganda is because they have an open door policy for refugees and are ready to innovate to improve their situations. This motivated us to work there to find new ways to engage the young refugees. Many of them are still reliving the conflict and the flight. You would sit face-to-face with them as they are telling you of all the things they miss and feel this tension in them that needs a release and a purpose. We want to try and give them a sense of purpose. Our idea is to develop, with the support of our partner the Western Union Foundation, a new branch of my foundation’s flagship programme, the Youth Peace Network (YPN), in the Kiryandongo Settlement, located in the north of Uganda. The essence of the YPN is to empower young women and men as peacemakers, change-makers and community leaders. The idea is to build a network that is going to be animated at first by a group of highly talented and motivated youth, who are trained by us. They will then replicate this training with other young people and carry out educational and small business projects with them. Overall, we aim to reach 10,000 refugees in the settlement as well as local Ugandans, who will make up one third of our youth force. These different training initiatives are very important to prepare these young talents for their roles. We have designed a certified curriculum based on a unique mix of courses in conflict resolution and mediation, life skills and meditation, business development and ICT. The ICT training does not happen in a void. To ensure that young people and their communities have access to ICT, we run a community learning centre where they can find computers and educational and reading rooms. These community centres are an essential part of the programme: they are community hubs where children and young people in general can take courses in literacy, ICT and business skills, and benefit from library services. The project in the Kiryandongo Settlement is very important to me and my teams, because it is the first time we will develop this programme specifically for young refugees. Just like the youth we train and mentor in other places and countries, we want them to feel supported to make a difference in the lives of their fellow community residents. We want to help them to make the present better and to prepare a future of peace and sustainable development. Our goal is for them to become voices for peace and change in their communities.